Famine reigned in Israel for 3 years as retribution for what Saul did to the Gibeonites. In an effort to make amends to the Gibeonites, David asks them what he can do for them. They demand 7 of Saul’s male relatives to be put to death. David complies. They are killed and David gathers up the bones of the 7 who died, along with Saul’s and Jonathan’s bones, and buries them together. This pleased God, and He began to answer prayers again. David is still battling the Philistines. He goes out with his men but is too old to continue to do so. David wins many battles. David sings a song of praise to God for saving him from his enemies. 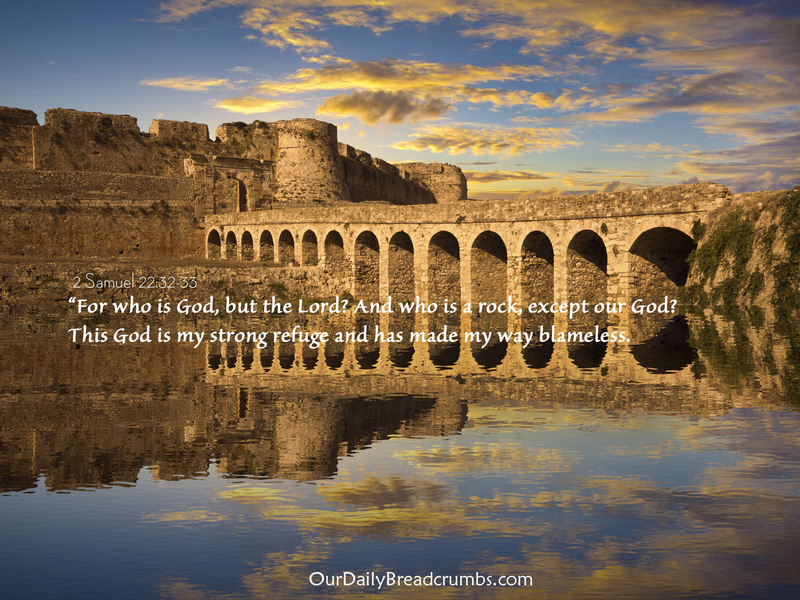 God is his rock and fortress. He rescued David. God has rewarded David for his loyalty. God does it all, including crushing David’s enemies, delivering him, and exalting him. 6) Personal Question. My answer: God keeps His word, and there’s consequences if someone doesn’t keep God’s word. Restitution is important to make up for a wrong done. God is just and good. God expects us to keep our promises. God expects nations to keep their promises. Time does not diminish our obligation to promises. God’s correction may come a long time after the offense. 7) David is close to God and is devoted. David uses vivid images to get his point across. He calls God his rock and fortress. God rescues him from the snares of death. God defended him by making the earth tremble and the heavens shake. God rescued David from deep waters. 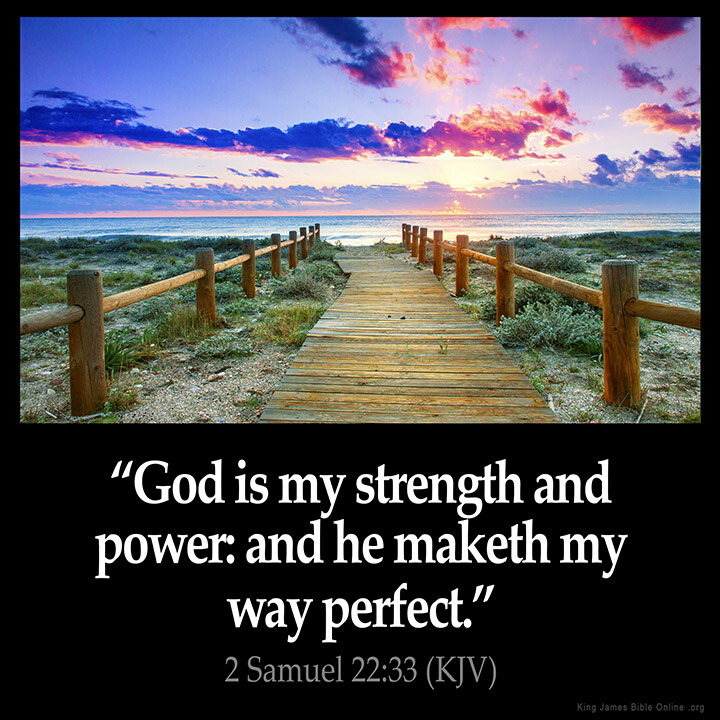 God is perfect and flawless. God delivered David, and David exalts God above all else. God’s kindness: God parted the heavens and came down for David. He shot arrows and scattered the enemies. He rescued David because He delighted in him. God trains David’s hands for battle and gives David His shield of victory. He broadens David’s path so he does not turn. He puts nations under him and sets him free from his enemies. God shows unfailing kindness to him. 8 ) Personal Question. My answer: The entire passage is inspiring, as it praises God for all who He is and all that He does for us. My favorite is verse 20: “He brought me out into a spacious place; he rescued me because he delighted in me.” This is God’s love. God loves us so much and delights in us so much that He daily rescues us through His son, Jesus Christ. This encourages me when I am down and inspires me to be more Jesus-like and try to live up to God’s expectations of me every day of my life. It’s interesting to see how God punishes other generations for the sins of others in the past. It’s also interesting to see how killing people is normal for retribution, and no one thought twice of killing others to pay for others’ crimes. It makes me glad I live in the 21st century, on this side of heaven after Jesus Christ. It makes me glad for the New Covenant. At first, you think mankind has changed, but we haven’t. We still “kill” innocent people every day — just under the guise of something else. We’re still punished today, just in different ways. David wisely sought God in the face of chronic problems. Apparently at some time during his reign, Saul attacked and killed many of the Gibeonites. This massacre isn’t recorded in 1 Samuel, but David didn’t question that it happened. In the days of Joshua – more than 400 years before David’s time – Israel swore not to harm the Gibeonites, a neighboring tribe (Joshua 9). God expected Israel to keep its promise, even though the Gibeonites tricked Israel into making the agreement. Saul’s crime was not only in killing the Gibeonites but also in breaking this ancient and important oath. If God has such a high expectations that men keep their covenants, we can have great confidence that He will keep His covenant with us. Good intentions don’t excuse bad actions. God cares about both our intentions and our actions. David did not dictate terms to the Gibeonites. He came to them as a servant, not as a king. The Gibeonites showed compassion: although the Israelites slaughtered their people, they did not ask for the same in return. They only held the man himself responsible: Saul. In ancient times, the request of the Gibeonites was reasonable. Instead of money, or an “eye for an eye”, they only asked for justice against Saul through his descendants. David agreed. David did not break his promise to Mephibosheth: he was spared. David would not fulfill one promise at the expense of another. The phrase before the LORD implies God approved of their execution and payment for retribution. The method of death fulfilled the promise of Deuteronomy 21:23: he who is hanged is accursed of God. These descendants of Saul bore the curse Saul deserved and so delivered Israel from the guilt of their sin against the Gibeonites. Deuteronomy 21:23 also explains why Jesus died the way He did. Galatians 3:13 explains: Christ has redeemed us from the curse of the law, having become a curse for us (for it is written, “Cursed is everyone who hangs on a tree”). Rizpah – the mother of two of the seven delivered for execution – held a vigil over the bodies until the late rains came. The coming of rain showed that the famine was over, that justice was satisfied, and that Israel was delivered. The bodies of these men were deliberately left unburied to emphasize that these men were executed as an act of judgment. David gave these seven a public burial, together with the remains of Saul and Jonathan. TAKE AWAY FROM UNANSWERED PRAYERS: When we see that our prayers are not answered, we should seek God to ask why. God will continue to raise up leaders when the leaders of the previous generation pass from the scene. David’s legacy lay not only in what he accomplished, but also in what he left behind – a people prepared for victory. With minor variations, this psalm is the same as Psalm 18. It is likely that David composed this song as a younger man – perhaps when Saul died, and he first took the throne, as described in 2 Samuel 8:14, when David had subdued all his enemies, and the LORD preserved David wherever he went. Yet in his old age, David could look back with great gratitude and sing this song again, looking at his whole life. This psalm is a great summary of David’s whole character and attitude through life. David piled title upon title in praising God because God’s work for David was so big and comprehensive that it couldn’t be contained in one title. God fulfilled the meaning of each title in David’s experience. David experienced the LORD’s deliverance from Goliath, Saul, Israel’s enemies, Absalom, and his own sins. Danger surrounded David on every side – physically, spiritually, emotionally, socially. God spoke on David’s behalf. The enemy wants us to believe that we can’t call upon the LORD in our distress. We can come to God in prayer because of the righteousness we have received in Jesus (1 Corinthians 1:30 and 2 Corinthians 5:21). When we show mercy to others, God shows us mercy. God brings light and strength to us, so we can see and so we can bear and overcome our troubles. We see in this psalm that David constantly moved back and forth from speaking about God (He delivers me) to speaking directly to God (You also lift me up). Paul quotes 2 Samuel 22:50 (Psalm 18:49) in Romans 15:9. Hard to grasp this form of punishment. An eye for and eye. I understand the need to honor our oaths, but I still struggle. Like you said. I’m glad I did not live in that time.